I thought I was creative with my post title, but it turns out that if you google the phrase “MDM is dead” you’ll turn up with tons of results. Some are really old like this one from 2012, which predicts that MAM is what will kill MDM. Others, like this one by security intelligence, are newer and emphasize something different, which is that EMM is useless without MDM, so therefore EMM is MDM. I’m definitely late to the party in saying that MDM is dead, but it looks like the phrase means something different to a lot of people. This is my perspective as an on-site professional. I think the buzz of MDM is dead. People used to get really excited about MDM. When I first started implementing MDM solutions for clients in 2012, a lot of people didn’t even know what MDM was. Now everybody knows what MDM is, and a lot of companies want it in some form or fashion. The problem with MDM is that it is not an all-encompassing solution. A lot of people assume that “mobile device management” solutions can manage everything on mobile devices, but that’s not the case. Passcode locks, camera, bluetooth, wifi, and and exchange configurations? Sure. But those are only possible to control because the device manufacturers make it so. What about the data that users can see? What about controlling the actually functions of digital applications on devices? Well unfortunately, that’s not part of MDM. That’s part of MAM. Between 2013 and 2015 is when the buzz for MAM really went wild. People started thinking, who cares about the device? If we just control the data, any device can be used and devices don’t have to be controlled at all. We can implement BYOD and fully scale at minimum cost. Unfortunately, this isn’t ideal either. What happens when a user physically loses their device and they just so happened to have some unprotected corporate data on it? You can’t wipe a device that’s not being managed. Sure MAM allows the app to be wiped, but what if the user wrote a note or a password or took a picture? Those aren’t managed by MAM. In reality, MAM is only a partial solution as well. The security-minded company needs something more complete. When it comes to mobile device management there are so many acronyms that it’s kind of ridiculous. What is even more ridiculous is that the majority of these acronyms tend to stay, so you can’t really ignore them as they come along. Terms like MDM, BYOD, MAM, and IoT, for example, have all become fairly prevalent (though terms like MIM have become mostly ignored). There was a singular event that allowed UEM to turn the corner: Microsoft provided an API function resembling MDM for lightweight management of Windows 10 devices in July 2015. This opened the door for consistent management abilities across all device form factors, including smartphones, PCs, wearables and IoT. This is where things get interesting. If you think about it, companies usually manage their mobile devices and PCs completely separately. Usually you’ll have an MDM/MAM solution like Afaria to manage mobile devices, and a robust PC management solution like SCCM to manage Windows PCs. Although SAP does have some PC management features available via custom Afaria executable, in general most companies tend to go with the Microsoft tool SCCM to manage Microsoft PCs. When Microsoft enabled MDM on Windows 10 devices, however, that potentially made it possible for one singular MDM solution to realistically manage not only mobile devices, but all Windows PCs as well. Securityintelligence takes this line of thinking and extrapolates it out into the future: eventually companies will be able to have one solution that manages everything, including mobile devices, PCs, IoT, wearables, etc. Pretty much any device with a wifi chip. At that point you won’t just have an MDM solution, you’ll have an “everything” solution. In other words, a “UEM” solution. You can already see MDM solutions trying to be “UEM” solutions now. Mobile Iron doesn’t just do just mobile devices, they can manage anything with Windows 10 and are developing solutions to manage IoT devices too. Microsoft offers both SCCM and Intunes as cloud services. Airwatch offers laptop management and is looking for use cases for IoT. It looks like the industry sees the potential of being able to manage everything from one spot, and vendors are desperately trying to innovate their way to the top spot. The best value you can bring to a customer is being able to do everything for them. What are my thoughts? Well, I don’t think the term “UEM” will ever become popular. If you search “UEM” you’ll struggle to get relevant hits. If I had to guess, it’s because Google has already popularized the acronym EMM, or enterprise mobility management, in regards to their solution Android for Work. 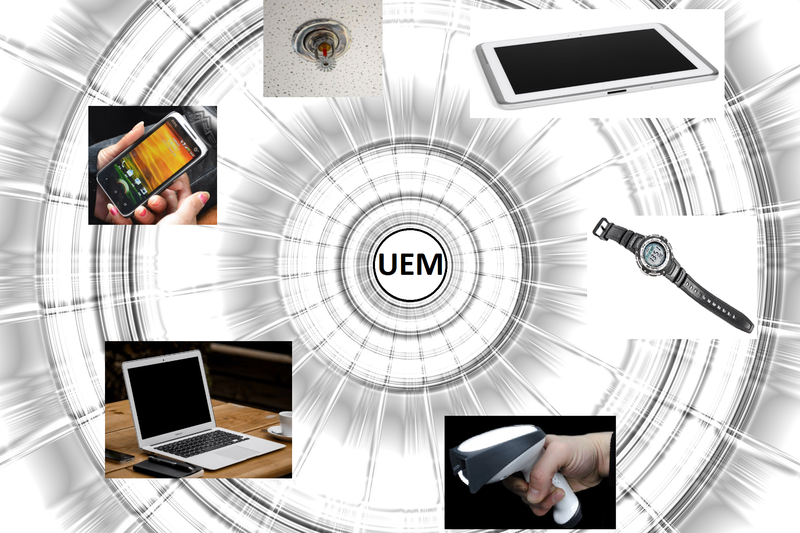 If you think about it, EMM and UEM are almost the same thing. My takeaway from securityintelligence’s article isn’t the new acronym, but that we’re really living in an exciting time for mobile management. The IT world changed drastically when MDM was widely adopted, and now corporations all over the world are enabling their employees to work mobile. But now all that just seems like a first step. As everything becomes “smart” and connected, companies will want one central point to manage everything, including IoT, mobile devices, and computers. Although I’m not excited about the new acronym, I am excited about how the concept will be implemented in the industry.